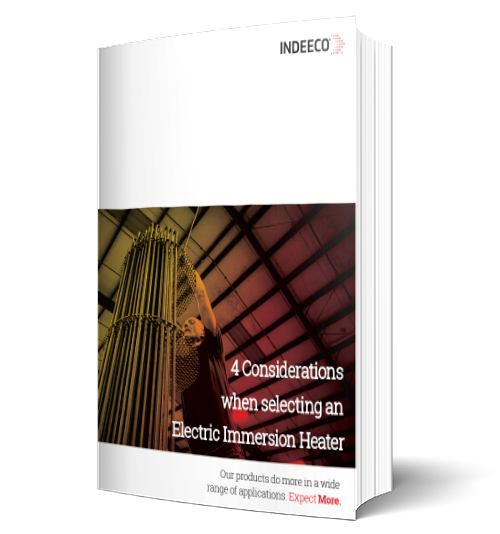 Indeeco’s explosion-proof flanged immersion heaters are one of the most widely used solutions for heating fluids and gases in hazardous locations. Designed for use in tanks, vessels, and in-line heating, Indeeco's explosion-proof flanged immersion heaters are easy to install and maintain. Spacer support rods provided for immersed length greater than 30"
Provided when necessary to allow for cooler operation of the terminal box. This allows the heating elements to be sealed with epoxy or RTV and for the customer to provide incoming wire with a much lower insulation temperature rating. The heater can be supplied in accordance with ASME section VIII Div. 1 U-Part stamped and certified. Bulb and capillary pilot duty or load carrying thermostats can be provided to control the heater. The thermostat bulb can be installed in a thermowell to sense process or element sheath temperature. Type J or K thermocouples can be provided to monitor the process or element sheath temperatures. Thermocouples provided with a ceramic wafer head and screw terminals for ease of wiring. Alternate type E or T available. A ceramic to metal soldered seal can be provided to eliminate the possibility of moisture from entering the heating element. Allows troubleshooting and isolation of a failed heating element. Construction utilizes alternating half baffles spaced closely to cause increased flow velocity across the heating elements to allow better heat transfer from the elements to the fluid. Add support rods for flanges with length less than 30"
Support rods can be added to shorter heater with high flow to keep the element support spacers in place. Element bundles with smaller outside diameter can be provided for any flange size requested. A chemical treatment in nitric acid can be performed to remove free iron from the outer surface of stainless steel for applications sensitive to contaminants. Is a process similar to plating using cathode and anode reactions but material is removed rather than added to the heater surfaces in order to provide a clean and bright finish. Heavy duty pipe and plate construction.